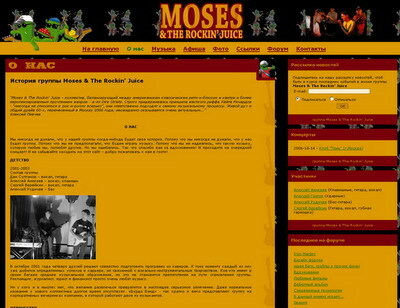 Website for Moscow blues band MOSES & THE ROCKING JUICE. We used the coloursed, whch customer had wished. Website is developed on ASBand CMS with some additional programming. Customer can add news, articles, lyrics, dates and photos. Website pages are well search engines optimized. Official website of State court administration of Ukraine in Chernivtsi region. This ois the new version of website. Now website also has the new domain name. "3 Betony" company. Company mainly produces ferro-concrete constructions. Website is developed on Joomla CMS. Personal blog of Volodymyr Osypov. Based on Wordpress with little changes of ready template. Creation of unofficial website (student portal) of department of Applied Mathematics in Chernivtsi Natinal University. Project is supported by AuroraScorpio. Portal based on Joomla CMS. Simple design for one page website, which sells mobile phone account vouchers.